Ward organized Dec 31, 1916. After the organization of the ward the Saints of the Ogden 13th Ward met for worship with the Saints of the Ogden 6th Ward until June, 1917, and in the meantime, the Saints, by advice of the First Presidency of the Church, proceeded to build a temporary meetinghouse, which was done at considerable expense and labor. At that time, that labor commanded high war prices. The erection of the house was commenced June 26, 1917 and construction proceeded quickly so that the first meeting was held a month later, on July 22nd. This temporary wood-frame building was dedicated by President Anthon H. Lund on Dec 30, 1917. Standing just east of the present modern meetinghouse, the building was sold and removed in 1921. As the 13th Ward grew it was deemed necessary for the ward to erect a new and better meetinghouse than the one erected in 1917. A committee was appointed for the purpose of constructing a modern building in Sep 1919 when the plans were completed, and the work of construction went on rapidly. 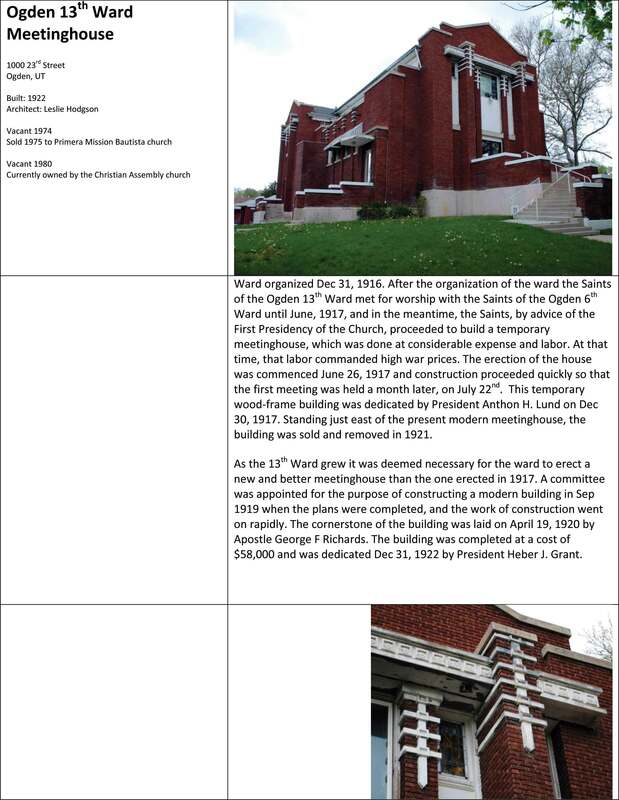 The cornerstone of the building was laid on April 19, 1920 by Apostle George F Richards. The building was completed at a cost of $58,000 and was dedicated Dec 31, 1922 by President Heber J. Grant. President Heber J Grant offered the dedicatory prayer at the dedication services of the Thirteenth ward chapel Sunday afternoon. Apostle George Albert Smith was one of the principal speakers. Bishop J Howard Jenkins conducted the service, which was attended by more than 400 adult members of the ward and a number of special invited visitors. The service was for members of the ward only. The new chapel occupies an elevated site at Twenty third street and Jackson avenue. It is the most beautiful building owned by the Latter Day Saints in Ogden and conceded by the church authorities to be one of the most beautiful in any of the wards of the church. The exterior is of dull red brick with white stone facings. The interior includes a chapel with a seating capacity for 500 people. The furniture and woodwork is oak. The windows are of stained glass. The pulpit stand is on the north end of the chapel with the choir seats immediately below. A feature of the chapel is the balconies on the east and west sides, the floor being raised two feet above the center of the chapel to allow the placing of two heavy steel girders. The chapel was beautifully decorated with potted ferns, cut flowers, and Christmas wreaths. In the basement is a large amusement hall with a stage, the baptismal font, one of the most modern in the city, is in the south end of the basement. A motion picture machine room is immediately above the font room. A large stage, kitchen and a class room is also included in the basement. On the main floor, besides the main auditorium, is a Bishop’s room and two classrooms. On the third floor there are three classrooms and a prayer circle room. Also in the building there is a fire-proof vault, a library and a drinking fountain. President Grant said he congratulated the members of the ward most heartily for the accomplishment of their splendid structure. He always rejoiced when people built beautiful church buildings, he said. Some people, he said, liked to live in beautiful homes, but were slow to contribute to the erection of places of worship. He had observed that poor people donate more for the erection of churches than those of greater wealth. In Nov 1932, a turkey dinner was held in the Recreation hall to raise money to buy coal for the winter. Tickets were 35 cents, 300 people were served, and $50.65 was raised. In Mar 1938 a dancing party was held to assist in the ward maintenance and to pay for brass kick-plates placed on the outside oak doors. Remodeling of the baptismal font was also done. 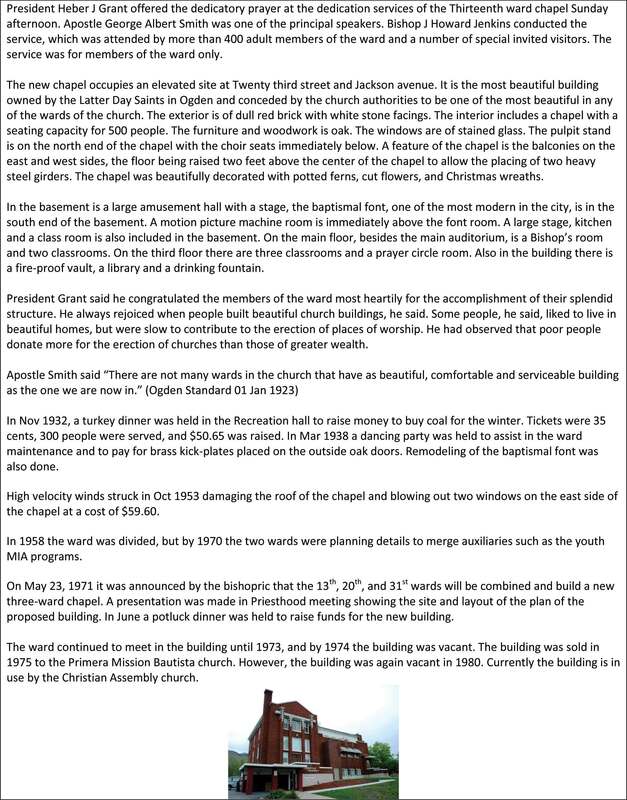 High velocity winds struck in Oct 1953 damaging the roof of the chapel and blowing out two windows on the east side of the chapel at a cost of $59.60. In 1958 the ward was divided, but by 1970 the two wards were planning details to merge auxiliaries such as the youth MIA programs. On May 23, 1971 it was announced by the bishopric that the 13th, 20th, and 31st wards will be combined and build a new three-ward chapel. A presentation was made in Priesthood meeting showing the site and layout of the plan of the proposed building. In June a potluck dinner was held to raise funds for the new building. The ward continued to meet in the building until 1973, and by 1974 the building was vacant. The building was sold in 1975 to the Primera Mission Bautista church. However, the building was again vacant in 1980. Currently the building is in use by the Christian Assembly church.